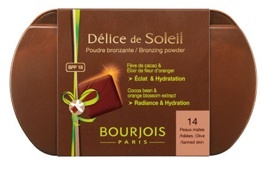 You would be hard pressed to find a women who doesn’t love, or at least owns or has owned a Bourjois Delice de Poudre Bronzing Powder (£6.99). For those of you who don’t speak French, thats the bronzer that looks and smells like a bar of chocolate. The chocolate bronzer is good value, gorgeously scented and has great pigmentation, offering a slight shimmer with flecks of gold whilst still looking subtle and natural. All of these factors are what makes this product a bestseller and a favourite to so many, so how will Bourjois’s latest bronzer compare? Upon first impressions the Délice de soleil bronzing powder seems to be the ‘de Poudre’ bronzers sophisticated older sister. 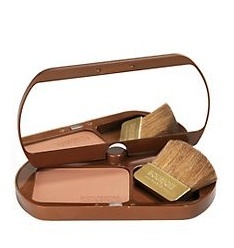 The packaging is a step up from the cardboard packaging and fun chocolate bar appearance of the ‘de Poudre’ and is instead a sleek brown compact which swivels open to reveal a mirror, application brush and the bronzing powder itself. Again this bronzer has that delicious chocolate scent that we all love so much but the formula is very different to it’s baby sisters. The texture of the powder is ultra-fine and is intended to create more of a naturally sheer glow. It is also great for your skin, containing cocoa bean for radiance, orange blossom extract to keep the skin hydrated and SPF 15 to protect you from the suns damaging rays. Bourjois tested the product out on 21 women over 3 weeks of whom 95% agreed the product created a natural tan, 90% agreed it gave a radiant complexion and 100% agreed the texture was soft and comfortable on the skin.